The Yarl’s Wood detention center for immigrants, the target of numerous allegations of mismanagement, has gathered a crowd of protesters seeking its closure once again. Around 400 of them could be seen outside the Bedfordshire complex Saturday morning. The protesters, many of them women, like the majority of inmates, waved banners and chanted for the facility’s immediate closure. Many banged on the fence, others even played music. All the while, inmates looked on from the inside, waving anything they could find as a show of support for the action. "The British public needs to come down here and pull those walls down, and bring these people out. And today, for the first time, I felt what it's like to be restrained in a free country, this is not freedom, this is not levity, this is not the right example to show the whole of the world. Shame on the government, shame on imperialism, and shame on capitalism," a protester and Asylum Community project representative told RUPTLY. 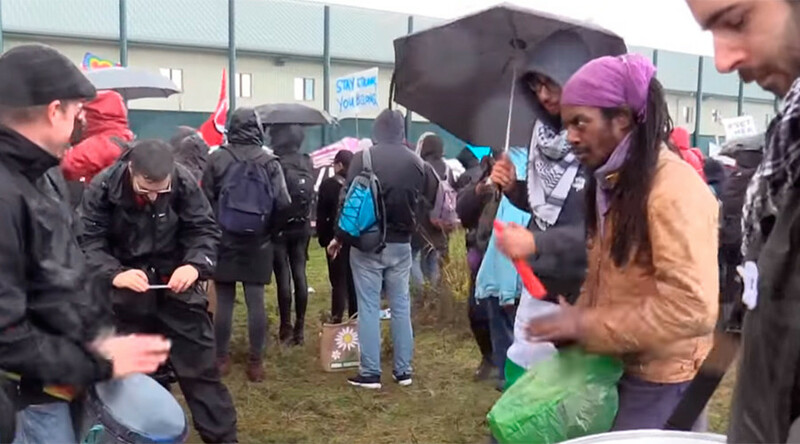 The rally comes a month after the Home Office had to apologize for unlawfully detaining a pregnant Congolese woman and holding her at the compound without proper medical care, and with only one visit from a midwife. It also follows this summer’s labeling of the center as “a national concern” by Britain’s prison inspection authority. Her Majesty’s Inspectorate of Prisons (HMIP) expressed concern that some 99 women held at the facility were housed there in contravention of Home Office policy. These and other allegations have given Yarl’s Wood a bad name. Many inmates complain of sub-standard living conditions. One told RT they are being "treated like animals".